Inside: I may have hit upon the world’s most tasty dessert. 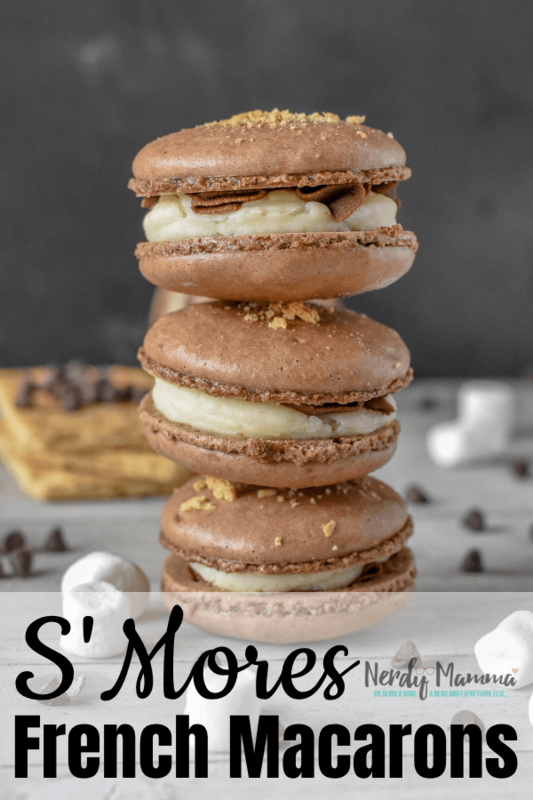 S’mores Macarons are the most s’more-riffic thing I think I’ve ever tasted. 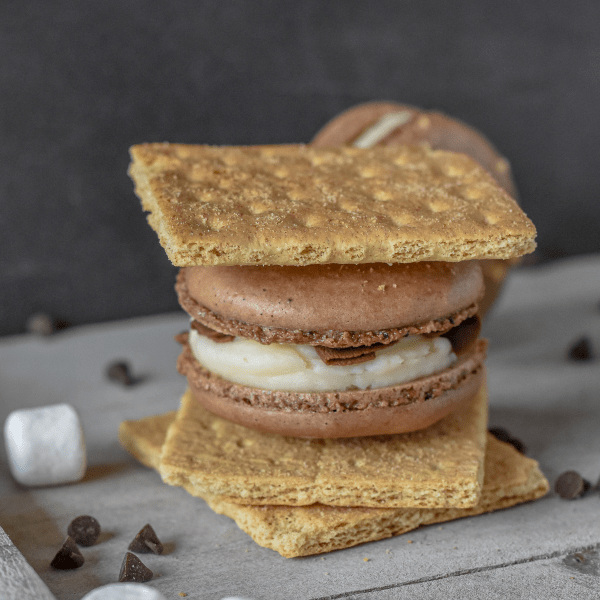 These S’Mores Macarons are so full of flavor–and they taste JUST LIKE a s’more. Only without the fire and the mess that comes with that. I mean, I’m allergic to the smoke. So, that means 2-3 days of sniffing and sneezing, coughing and wheezing if I make a fire. So, it’s gotta be REALLY important for me to strike a flame. 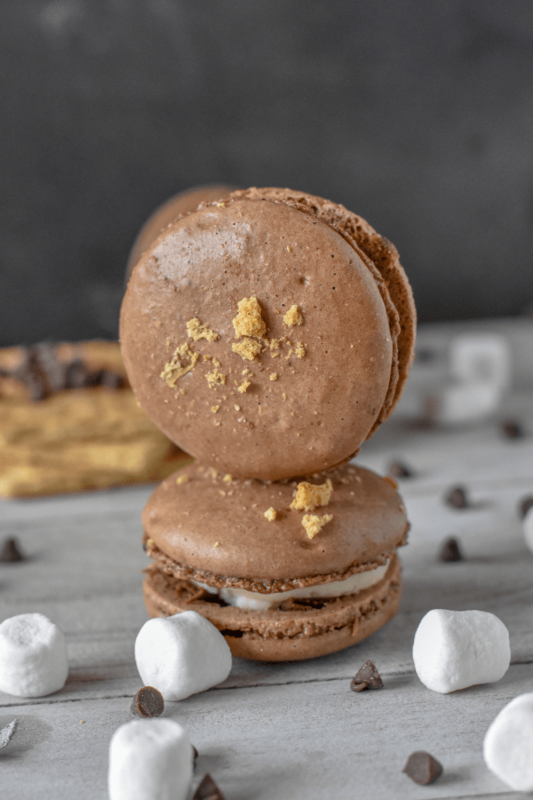 But, to make these S’Mores Macarons, no fire is required. Well, except for the fire in the oven. Because those things work with flame. Well, unless it’s electric. But, smores macarons are definitely so good, just like the came off the flame. 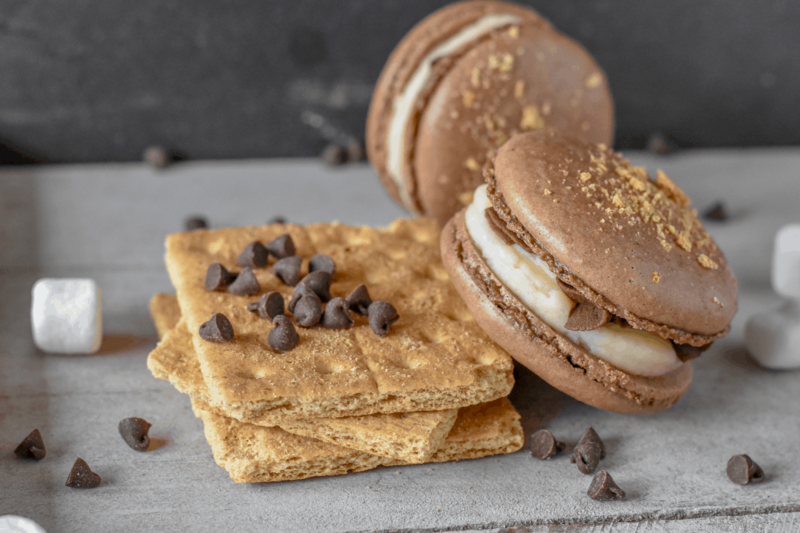 Before we go much further, I want to assure you that you don’t have to have any special tools to make these S’Mores Macarons, not really. But one thing that’s a total must is the food scale–no just for smores macarons, but for ANY macaron-making adventure. And then you need a template so you know about how much to put out on your silicone mat–and thus how big your cookies will be. 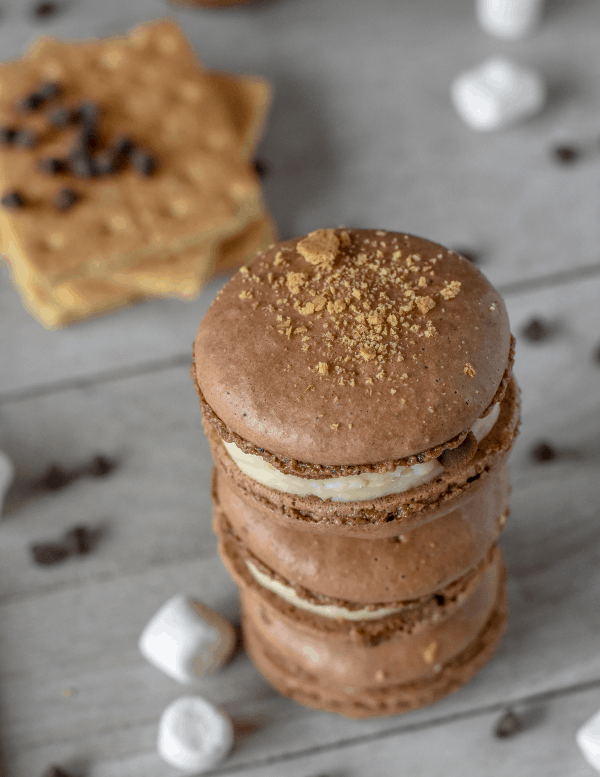 So, no real tools, just a couple of things…I’m starting to think I’m crazy here, but it really is simple to whip up a big batch of S’Mores Macarons–even if you wanted to double the recipe, it would be easy. Oh, and you’ll want to check out these 12 Tips for Perfect Macarons–because, you know, preparedness is key before you rush off to make any French Macarons, not just these S’Mores Macarons. I had tried several times to make macarons on my own. But, it wasn’t until the intervention of my friend Brittany that ended up saving me from failure. So, take those tips in mind. 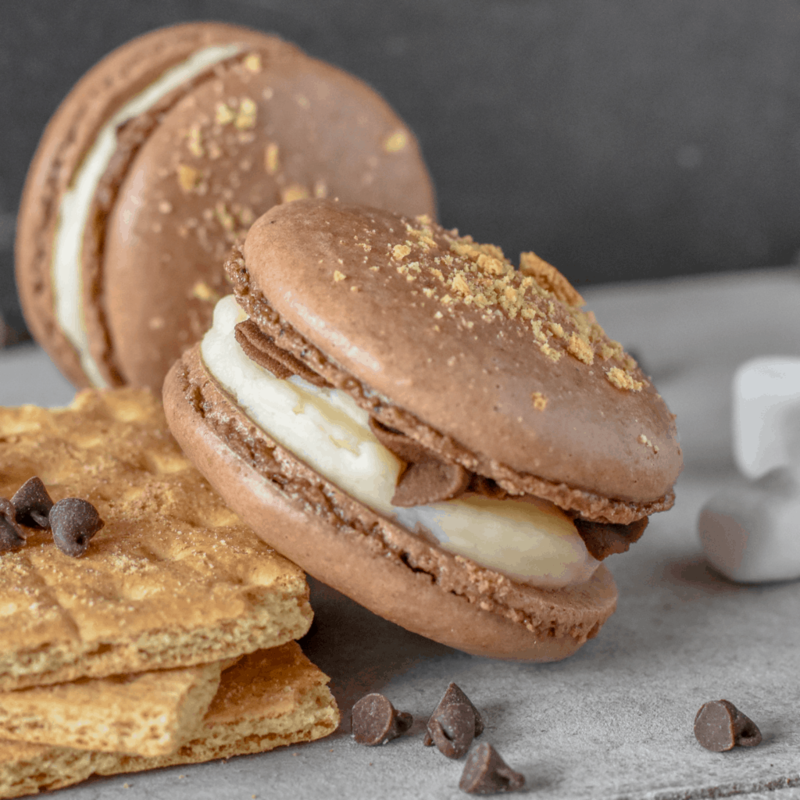 Now, don’t forget to pin these S’Mores Macarons, because you’re going to want to make them as soon as your food scale is in hand–and you don’t want to lose this recipe. Seriously, it’s SO EASY in comparison to some others out there. Just pin it so you can find it. That’s all I’m sayin’. I may have hit upon the world's most tasty dessert. 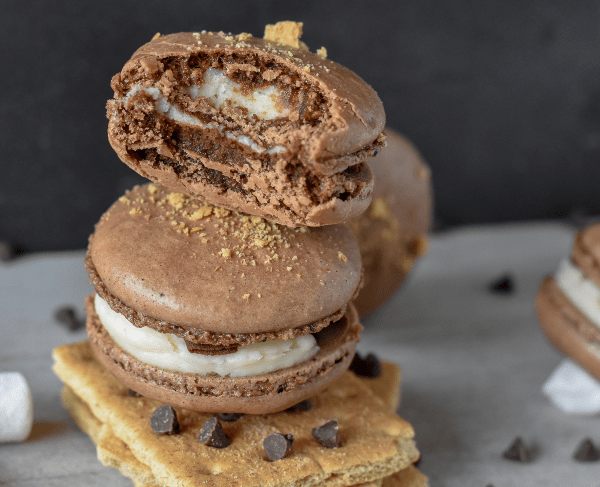 S'mores Macarons are the most s'more-riffic thing I think I've ever tasted. Weigh out all your ingredients. Next, sift your powdered sugar on a scale, and remove 2 level tbsp. Add in two tablespoons of cocoa powder, then add in your sifted almond flour. Give all of these ingredients a quick whisk to make sure there are no lumps. After the egg whites are the right consistency, add about ½ of the dry mixture to the egg whites and fold in until there are no dry spots left. Place the chocolate and heavy cream in a microwave safe bowl and heat for 30 second increments until completely melted. Allow the ganache to set at room temperature for 4 hours or in the fridge for 2. Before piping, whip with a whisk attachment for 4-5 minutes. Add the butter in the bowl of a stand mixer or large mixing bowl. Mix until light and fluffy, about 5 minutes. Add in the marshmallow fluff and mix for an additional 4-5 minutes. Add in powdered sugar one cup at a time and mix until combined. Add in vanilla and cream and mix on high speed for 6-7 minutes. Place in a piping bag or large ziplock bag. Place the ganache frosting into a piping bag or large ziplock bag with a star tip. Pipe a generous amount of ganache on half of the shells. Fill the other half of the shells with the marshmallow buttercream and sandwich the two halves together. Allow to “mature” in the refrigerator for 24-48 hours and enjoy!! And, if you’re still craving a great macaron recipe, be sure to check out these others!